Sue Wilson Pin Ball Die .. This is fabulous Sylvie, lovely pastel colours and lots of super details - such a pretty card. Lovely design and colours and great dies too. A great card .. fabby use of your dies .. great for using up some of those offcuts. Your weather sounds lovely. Are you sure you wouldn't rather have our wind and snow?!?!? BRRR!!! Hi Sylvie--Thanks for stopping by my blog! 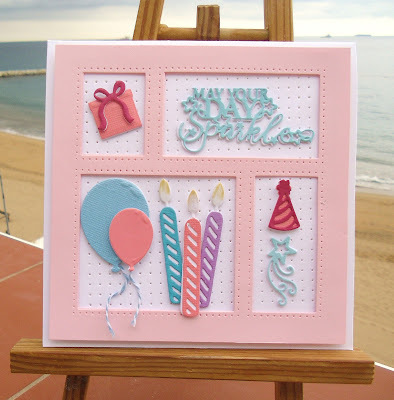 I love that shadow box die & all the cute elements--great card!